How do residents set up the electric in their name? New residents with University Towers can contact DTE to set up their electricity account once they have received their unit location. This is to be set up prior to moving in and will be the resident’s responsibility throughout the lease contract. If you do not have a US Social Security Number, contact your leasing consultant for assistance in setting up your DTE Energy account. What is a Lobby Attendant? University Towers provides an on-site lobby attendant. The attendant is here to assist University Towers guests and its residents. If you have any questions or can concerns, you can contact the office at any time. Yes, if you don’t have anybody in mind that you would like to live with let us match you up with somebody! There is a Roommate Matching Form that you can fill out to let us know more about what you’re looking for in a roommate. Then, we will spend time figuring out the best match for you based on that information. How do emergencies get answered at night when the office is closed? University Towers office is never closed, University Towers provides a 24-Hour Service for any lock outs, noise complaints, or emergencies. The on-site University Towers lobby attendant receive the phone call and answer the problems as they arrive. Everything you’ll need for your classes. Kitchen essentials to make your new apartment feel like home! Rent is due on the first of every month. There is a three day grace period and late Fees begin on the 4th of each month at $20 and an additional $30 if rent is not paid by the 10th of the month. Have your rent automatically sent from your bank account each month. University Towers does not allow pets of any kind. University Towers insurance will not cover your personal belongings. We have all of our residents get renter’s insurance for this reason. It is generally inexpensive and will cover your personal belongings if something were to happen. Most students are covered if your parents own a home in the United States. University Towers lease is binding and cannot be broken. If you cannot live at University Towers after signing your lease, you will need to sublease your unit. Please call the leasing office for information on subleasing. If you cannot live at University Towers after signing your lease, you can sublease your unit as soon as possible. University Towers office will put your apartment on their sublease list and will help you in your search for a subtenant for your apartment. If you need maintenance, simply go to our website and fill out a maintenance request. You can also call or stop by the front desk. If it is an emergency, please notify the front desk immediately. University Towers is fully furnished with a twin-sized bed, desk and dresser for each resident in their bedroom. If you have a living room area, there is a sofa, 2 chairs, end tables, lamps, two bar stools or a table and chairs. Your mail will be delivered to your apartment’s mailbox in the mailroom. You can only receive mail if your name appears on the apartment lease. If you have a package that doesn’t fit in the mailbox, you will get a message in your mailbox that your package is at the front desk. You will need a photo ID to pick it up. 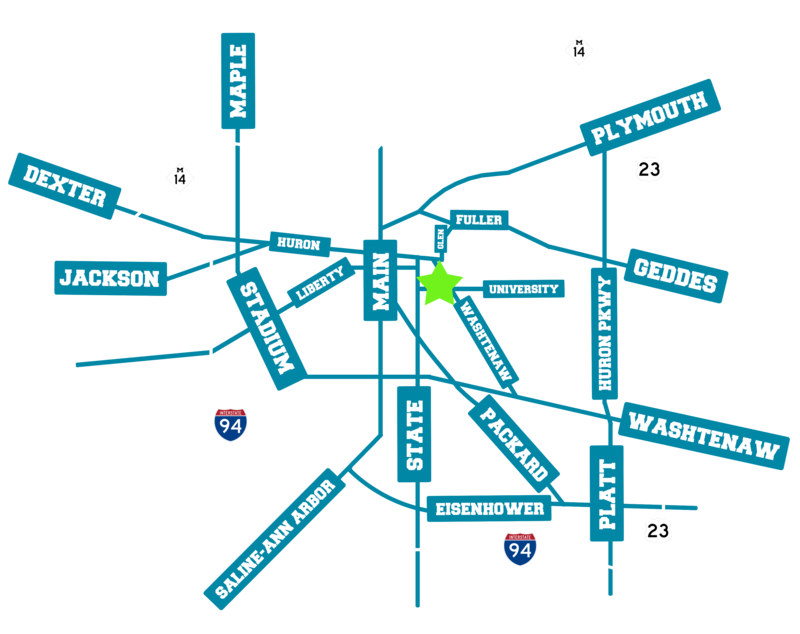 We are located on U of M’s central campus. There is a free U of M Bus shuttle that picks you up 1 block from here. It takes only minutes to get to your class! We also have bike racks outside University Towers if you choose to bring your bike. We don’t have any parking with our building, however, the City of Ann Arbor has leased us a small number of spaces that we can rent to you at market rate. How does your laundry system work? University Towers provides coin operated efficient washers and dryers in our laundry room. There is a change machine located in the lobby for your convenience. The laundry room is open 24 hours a day. Residents can do their laundry at their convenience.